Thousands of Waianae residents have been fed, served hot meals, given baskets of food, while hundreds have been led to Christ. Christ has blessed Bible & Basket, (B&B) over the past decade. Work continues Tuesdays and Wednesdays each week. The Waianae Baptist Ministry & Leadership Team has distributed thousands of baskets of food to the Waianae Community while proclaiming the WORD of God. Ernest Adaniya bags garbage along a major highway through the western part of O‘ahu in the U.S. state of Hawaii. Waianae Baptist 'Adopt A Highway' team over the past decade have removed thousands of pounds of trash along Farrington Highway through Waianae Town, and in parks. The homeless here, are treated just like any other human being. With highest per-capita homeless population in the U.S., it is predicted that encampments will continue to rise as housing options continue to decrease. The greatest number of homeless or houseless are concentrated along the Waianae Coast, the epicenter. They struggle with life’s most basic needs, but they don’t struggle alone, Waianae is still called 'God's Country'. Homeless have few options as Isle population grows. 'For I was hungry and you gave me something to eat, I was thirsty and you gave me something to drink, I was a stranger and you invited me in, I needed clothes and you clothed me, I was sick and you looked after me, I was in prison and you came to visit me.’ Matthew 25:35-36. Taking care of our community. 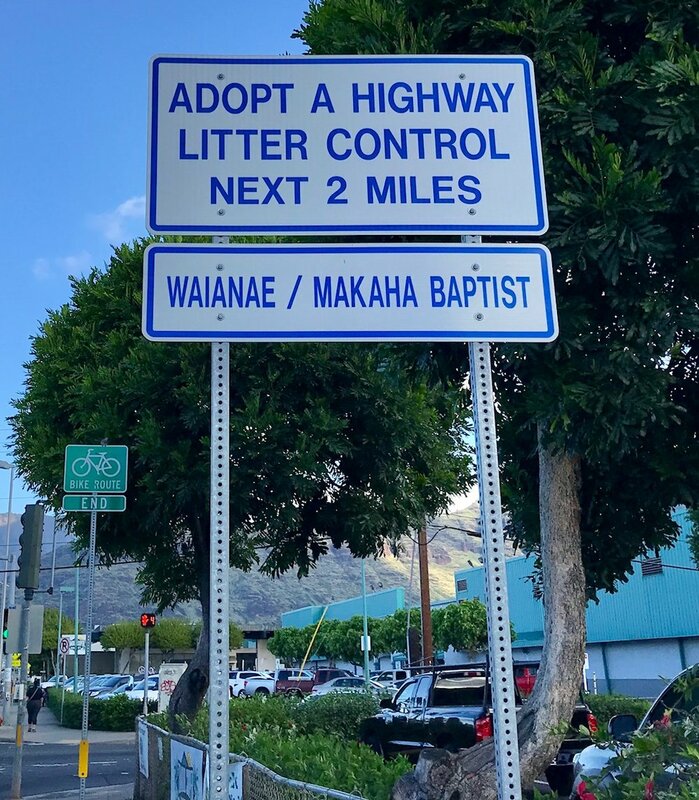 Adopt A Highway - Waianae Baptist undertakes our volunteer program every second Saturday of each month. Please join us as we support our friends and neighbors.